AP PGECET 2016 Web Options Step by Step Procedure @ pgecet.apsche.ac.in, andhra pradesh pgecet 2016 Procedure to exercise Web options along with screen shots. 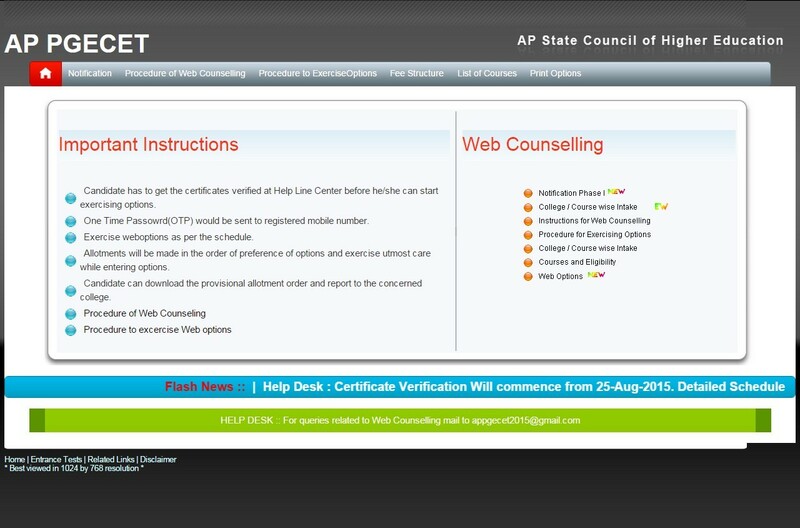 AP PGECET 2016 Web Options : The GATE qualified and eligible candidates of 2015 and 2016, GPAT and AP PGECET qualified and eligible candidates of 2016 are informed to attend AP PGEC/AP PGECET web counselling for admission into ME/M.Tech/M.Pharmacy courses for the academic year 2016- 17 as per the schedule given below at any one of the Help Line Centres. 1. Open the website http://appgecet.apsche.ac.in. Home page displayed as follows. 2. Click on the Web Options link for Exercising options. 3. Instructions to candidate window will be displayed as follows. 4. Read the instructions carefully, then click I Understood button. 5. 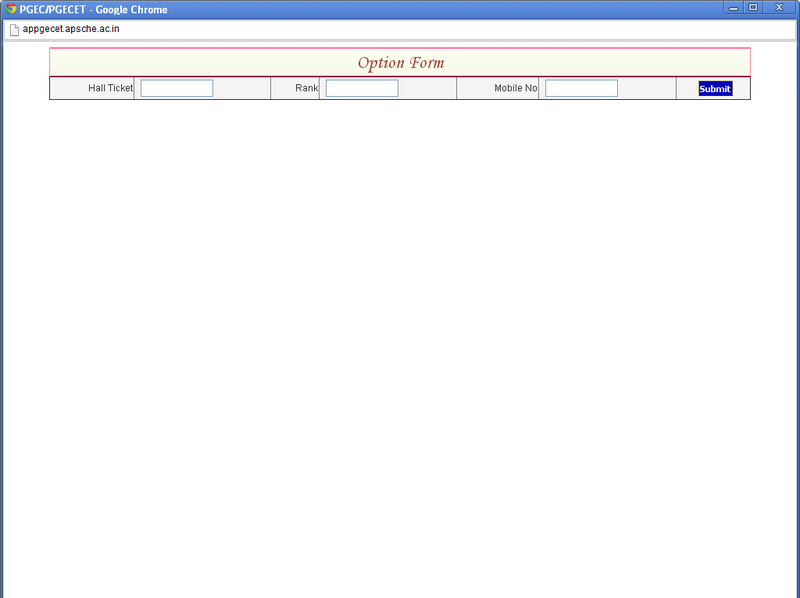 Enter the details as shown in the option form and click on Submit button. 6. 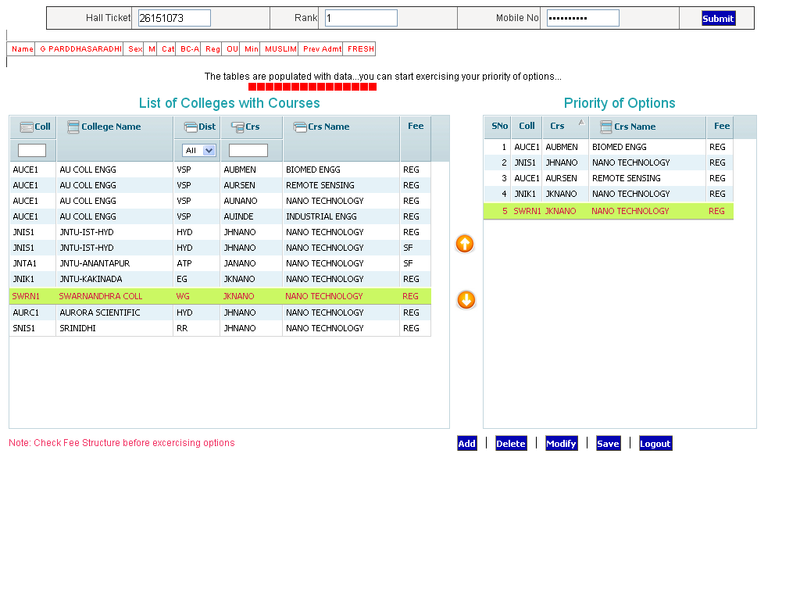 Option form will be displayed as shown below with colleges on the left side. This window displays all the eligible colleges based on gender and specialization. ⇒Two types of filters are available to minimize the selection list. The first filter is Alphabetical order and another filter as per the District. ⇒District alone will be displayed. ⇒If you Type one of the Alphabets, for example “P” is Typed, then the college codes starting with alphabet “P” will be displayed. 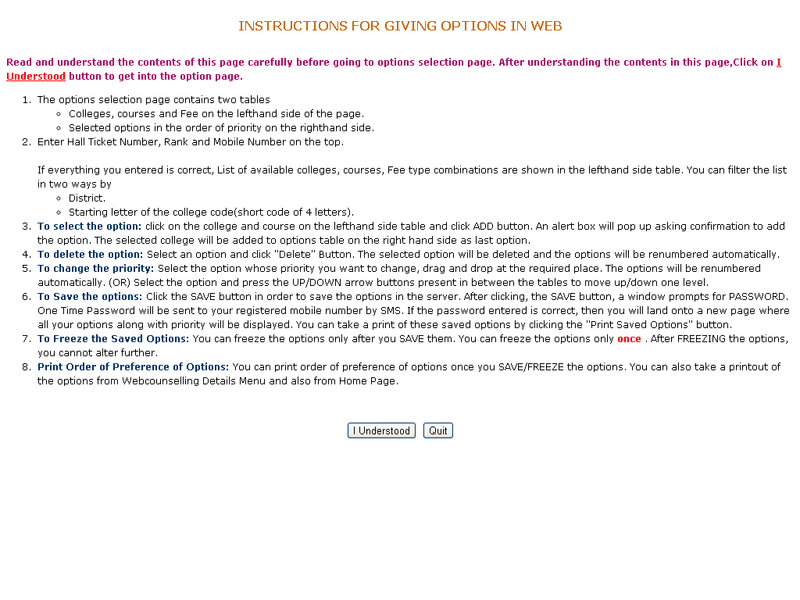 ⇒Select the college on left window and click to add to the right side window as option number one. Then next one will be added as second option and so on. The priority of options is displayed on the right side window. ⇒You can Modify the priority of options by clicking on the Modify button. Select an option, drag it to the required place and drop. Automatically the option will be moved to the new location and the priority numbers will be renumbered. (OR) Select the option and press the UP/DOWN arrow buttons present in between the tables to move up/down one level. 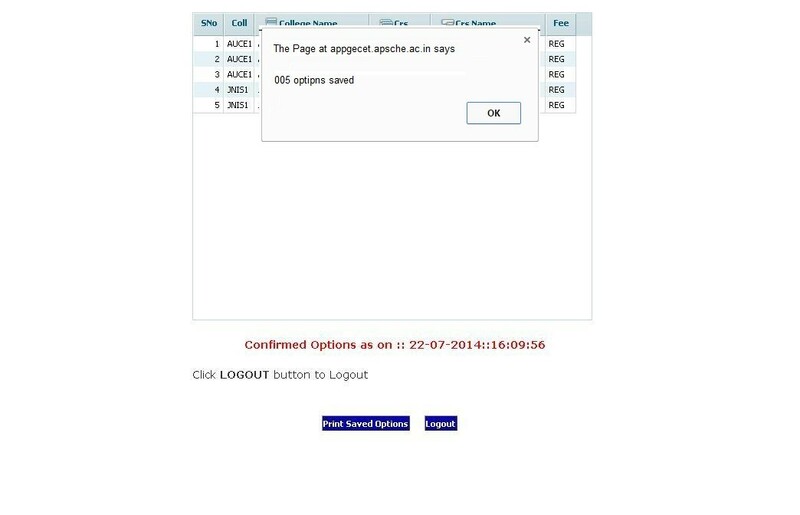 ⇒ Select an option and Click the Delete button, then the option will be deleted from the selected list. 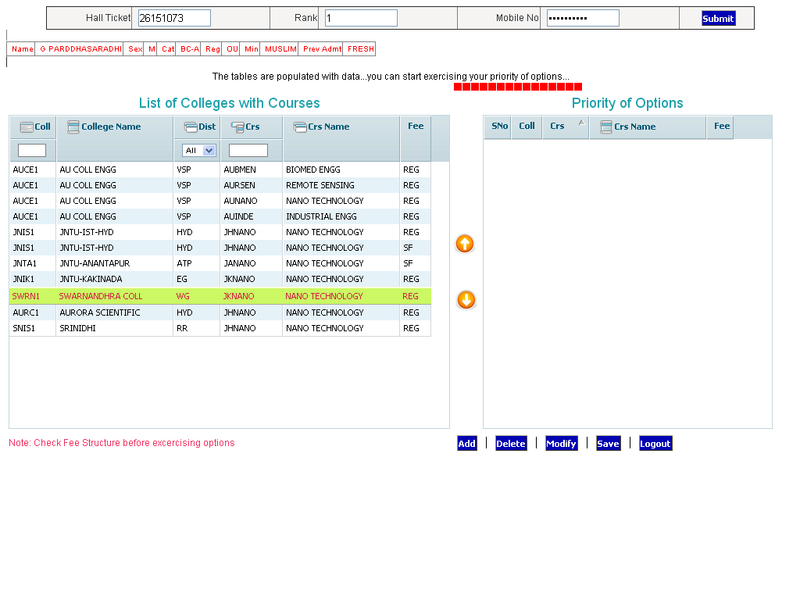 ⇒After satisfying with the selected list of colleges and their priorities, click on Save button and enter the password through the virtual key board available on the screen which you have received by SMS and click Confirm button, then the selected options are saved in the Server for processing, and the saved options will be displayed in printed format. Take a print and verify thoroughly the colleges and their priority. 7. 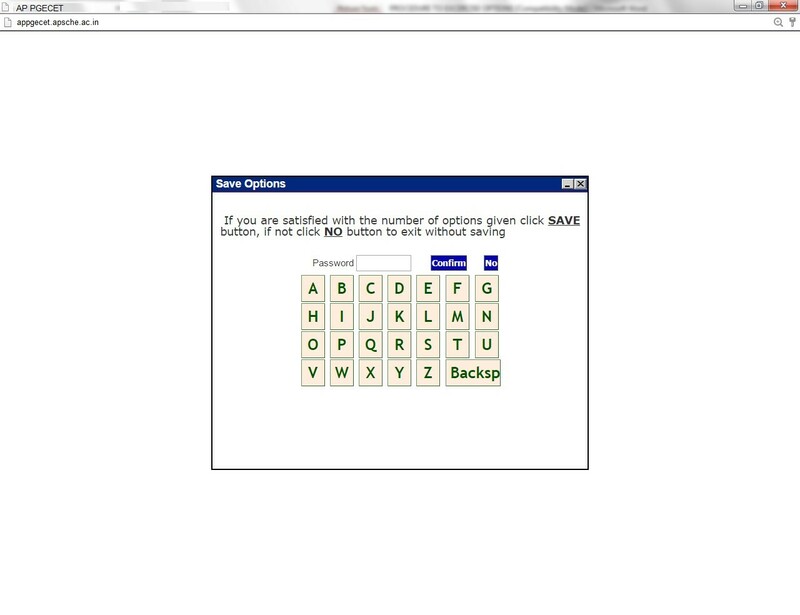 The Saved options can be viewed and/or print through the Print options link from home page also. 8. The options exercised will be closed at 00.00 Hrs mid night on the last date specified for web options in the notification. 9. The options registered in the server will be frozen automatically on the last day specified in the notification and shall be used for seat allotment. 10. The options will be processed on the dates specified and the results will be communicated through SMS message to the mobile number, which you have provided and you can also take a print of the provisional allotment order from the website. Do not use mobiles and tablets to exercise the options. Use only computers. Avoid using slow internet facility. Allotments will be made in the order of preference of options and exercise utmost care while entering options. Allotment made in the web counselling is final and cannot be altered under any circumstances. Therefore only such colleges and courses that candidate will join without any hesitation should be chosen. Convenor is not responsible for any technical or human errors from client side (Student side) while exercising options. Keep your mobile with you while exercising options and do not block SMS. What is meant by qualufying exam hallticket num ?what I want to type in that box can u plz tell me. I had got seat in first counselling but i didn’t have interest to join in that college will you please tell me second phase counselling details and is there any necessity to inform in first allocated college that i would like to go for second counselling and one more doubt is that what is the meaning for SCH fees type. what is the difference b/w NSC fee,SCH fee&REG fee. If i didn’t get any university/college then what about my ORIGINAL CERTIFICATES. Is there any type of second counselling? ?